This day ticket allows you to access Rock in Rio 2019 only on the 27/09. This day ticket allows you to access Rock in Rio 2019 only on the 28/09. This day ticket allows you to access Rock in Rio 2019 only on the 29/09. This day ticket allows you to access Rock in Rio 2019 only on the 03/10. This day ticket allows you to access Rock in Rio 2019 only on the 04/10. 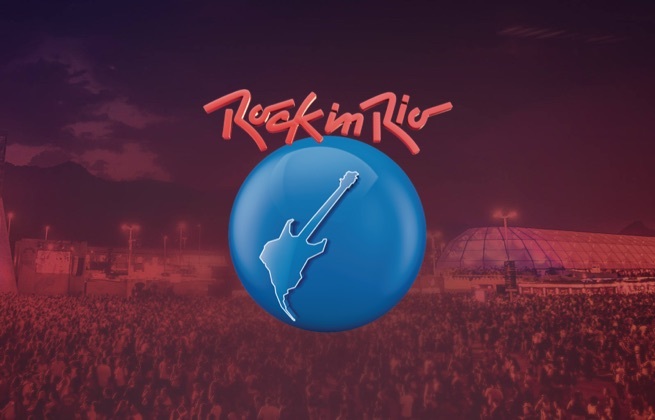 This day ticket allows you to access Rock in Rio 2019 only on the 05/10. 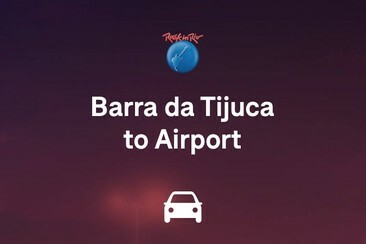 This day ticket allows you to access Rock in Rio 2019 only on the 06/10. Royalty Barra Hotel is located on the seafront of Barra da Tijuca Beach and 900 meters from the only metro station in Barra da Tijuca. The hotel has complimentary breakfast, as well as a restaurant, a bar and a tearoom. Other amenities include a fitness room, a hot tub and an outdoor pool with mountain views. A kids' playground is on-site and parking is available (fee). This 4-star hotel offer rooms with tiled floors, wood furnishings and natural tones, Wi-Fi (fee) and flat-screens, plus minifridges. All offer balconies with ocean views. Radisson Hotel Barra Rio de Janeiro is located in the West Zone of Rio de Janeiro, the Barra da Tijuca district is known for its beautiful beaches, lakes, mountains and rivers. It is also within minutes of Barra da Tijuca beach and two popular shopping centers, Downtown and BarraShopping. Stroll among the Amazonian trees and plants at the Botanical Garden, nine miles from the hotel, or enjoy a picnic under the palm trees at Bosque da Barra Municipal Nature Park, just three miles away. Many nightclubs and restaurants lie within a mile of the hotel. 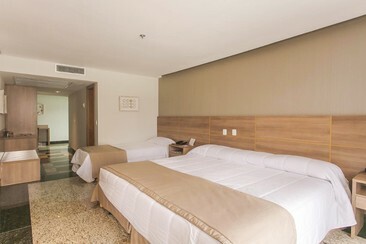 Each of the 378 rooms offers home comforts like free Wi-Fi and an armchair. Other amenities include a desk, a minibar and a flat-screen TV, air conditioning and a ensuite bathroom with hairdryer and free toiletries. The Quality Rio de Janeiro is located conveniently next to the Jacarepaguá Lagoon, just a short drive from Parque dos Atletas. The stunning beaches of Barra da Tijuca are 6.2 miles away. 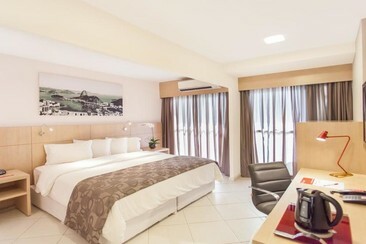 The hotel offers spacious, air-conditioned rooms, a swimming pool, a fitness centre and free Wi-Fi. 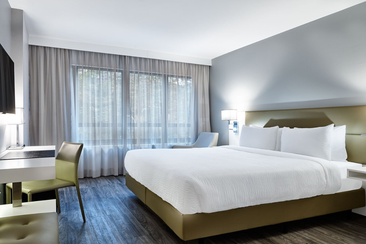 All rooms are bright and tastefully decorated in earthy tones and with tiled floors and feature flat-screen TVs, minibar, desks and private bathrooms. Guests can enjoy international specialities and a selection of drinks in the hotel's restaurant. The daily breakfast buffet offers a variety of fruits, bread and cold meats. Room service is also available. The hotel is within 18.6 miles of many of Rio de Janeiro's landmarks, such as Maracanã Stadium, the iconic Christ the Redeemer statue and Ipanema Beach. 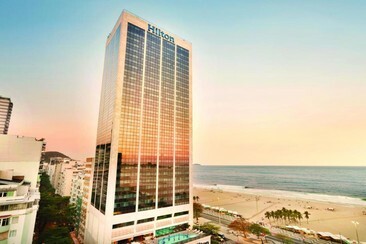 Hilton Rio de Janeiro Copacabana is ideally located across from the blue waters of Copacabana Beach. Copacabana Fort is 3.2 km away. Santos Dumont Airport is 9.6 km away, while Galeão International Airport is at a distance of 27.6 km. Charming shops, restaurants and lively bars are found just 2 blocks away from this hotel. The hotel offers bright, sophisticated rooms with air conditioning, a TV and a minibar. They are elegantly styled with wooden furniture, contemporary decor and warm, natural tones. Most rooms feature amazing ocean views. Shuttle transportation to and from the hotels. 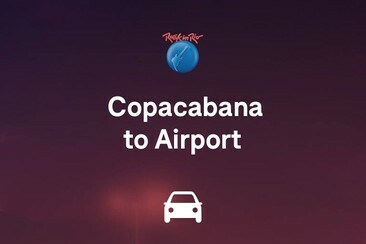 One-way private airport transfer for up to three people from RIOgaleão-Tom Jobim International Airport to hotels in Copacabana. Note: Hotels will be confirmed later. 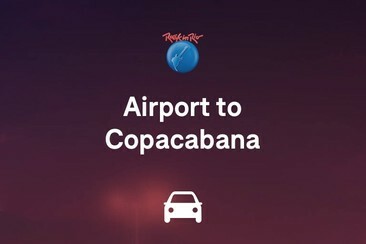 A one-way private airport transfer for up to three people from hotels in Copacabana to RIOgaleão-Tom Jobim International Airport. Note: Hotels will be confirmed later. A one-way private airport transfer for up to three people from hotels in Barra da Tijuca to RIOgaleão-Tom Jobim International Airport. Note: Hotels will be confirmed later. A one-way private airport transfer for up to three people from RIOgaleão-Tom Jobim International Airport to hotels in Barra da Tijuca. Note: Hotels will be confirmed later.